In the last tutorial, we have discussed about Getting Started with Microcontrollers and how they work and now we are gonna have a look at Getting Started with PIC Microcontrollers. PIC microcontrollers, as i mentioned before, manufactured by Microchip.There are many types of microcontrollers but here I am concerned with PIC18F452.So let’s have a small review about PIC18F452 PIC microcontrollers. 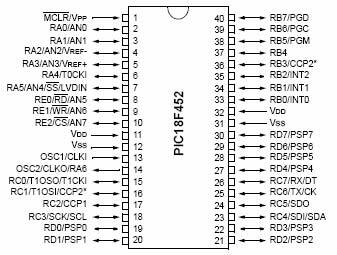 PIC18F452 is a 40 pin microcontroller each pin has its own functionality,which we will see in our next classes one by one. suppose I want to create a project on LED blinking, a simple project on PIC so what I have to do.First of all, I need the following things so that I may use them to work with PIC. 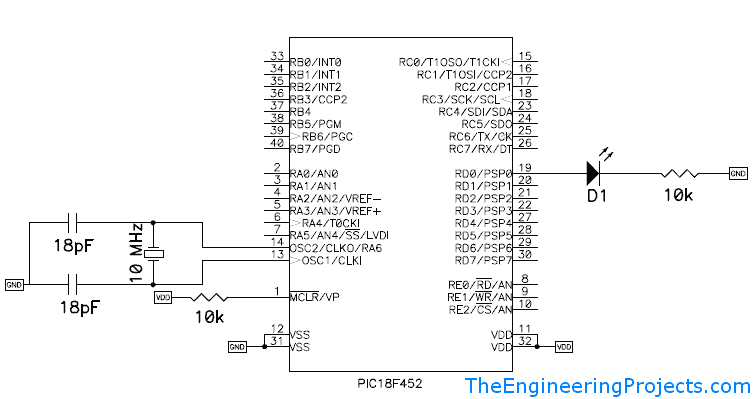 I have discussed the Functions available in PIC18F452 Micrcontroller in the next post. MPLAB —> MPLAB is a software which you can download easily from official website of Microsoft as its an open source software.In MPLAB you will do programming in Assembly & C Language.We will learn Assembly & C Language in our next classes. NOTE : We will learn the Assembly & C language in our next classes .This software has already sent to all the registered users. If you need it ,then Subscribe to our Email Notification and this will be forwarded to you . Thanks. PIC Programmer —-> There are many PIC Programmers available in market ( Hall Road in Lahore ). You have to attach this Programmer with the PC through serial port (Parallel Port & USB Port PIC Programmer are also available). Now Put you PIC in the 40 pin socket of Programmer. PICpgm Software / PICKit software —-> This software is used to burn thr program in the PIC .Its just like the same as burning a movie on DVD.Now open this software and browse to your program which you have made in MPLAB and then click on program PIC and your Program will be burnt on your PIC. Thanks for nice information about MCU’s.